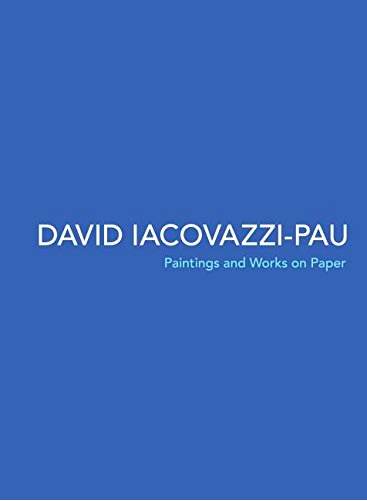 David Iacovazzi-Pau, whose paintings and works on paper are now on view at the Carnegie Center for Art and History in New Albany, Indiana, has a straightforward, unaffected approach to portraiture. Unlike some portraitists who have a dominant agenda--for example, psychological realism or the glamorization of their sitters--Iacovazzi-Pau is mainly interested in having his completed images broadcast both visual and emotional "rightness." His job, as he sees it, is to paint his subjects honestly, without letting his ego get in the way. He is both astute and modest. "The most important thing," he observes, "is to make sure that my paintings keep the feeling that I have when I am around my subjects." You seem to have a natural interest in people's character. Have you always been that way? I've always been interested in people's stories and in idiosyncratic personalities. Conformist attitudes bother me, so working with diverse personalities fits my spirit of inquiry. I usually feel more comfortable in a one on one situation because it often draws out the genuine makeup of a person. Looking back I can find some examples of my interest in people, such as when I was fifteen or sixteen I was eager to meet Martin Gray after reading his autobiography, "For Those I Loved". At that time he was living in the south of France, so while I was there on vacation my grandfather and I called him from a phone booth near Fréjus. He was kind and courteous and told us he would have liked for us to stop by but he was getting ready to leave for the U.S. I was also fortunate to have my parents and grandparents taking me and my brother on trips around Europe and North Africa, as well as the U.S before I was 18. It exposed me to different cultures and mentalities which probably shaped the way I see things and perhaps emphasized my interest in people. Tell me about your portrait of Gunnar Deatherage and what you want it to project. I enjoy learning something new each time I work with someone and working with Gunnar was no exception. 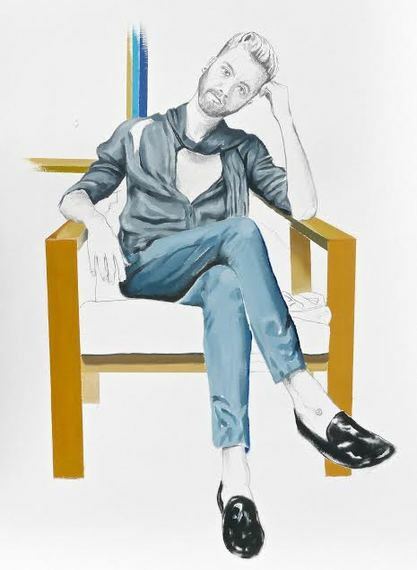 He's a young talented fashion designer and one of the aspects I wanted to project was his style by highlighting only parts of the drawing with colors that to me are reminiscent of him. Gunnar works mostly with black and grey which are predominant in the portrait. Giacometti once said, if you close your eyes and think of someone you know, you will picture them facing you - not in profile or three quarter - I tend to agree with this observation, plus it's easier to get more information that way. That's why most of my portraits are done in a frontal pose such as this one. What are the challenges of doing double portraits? 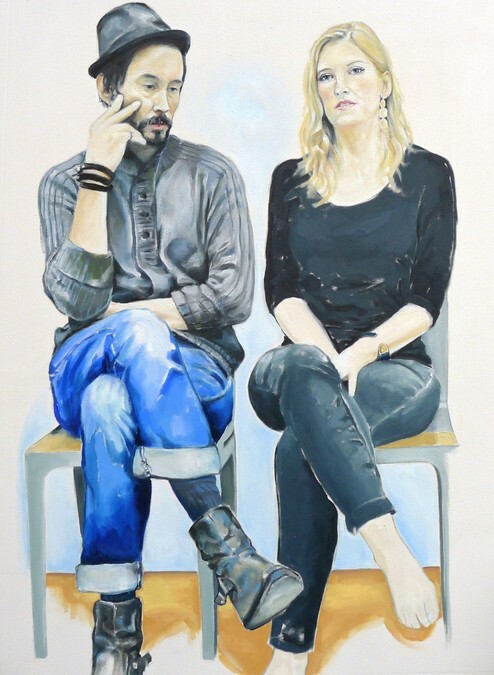 The challenge for me is to portray two people and still have their individual identity coming forth as the main focus of the painting. The narrative of their relationship or chemistry is always done in subtle ways via a certain pose or a particular disposition of color(s) for example. But I don't want it to become the predominant aspect of the painting. How does it feel to see so many of your portraits in one place? I'm pleased with how the curator, Daniel Pfalzgraf arranged the artworks. He gave each artwork enough space between them so they don't look smothered. It allows the viewer to give more attention to the portrait without being distracted. When I see the show and walk around the gallery, looking at each portrait brings me back to their stories and the time I spent with them. It's a good feeling overall even though there's a hint of melancholia. What kinds of reactions have you been getting to your show? So far it's been all positive. People are starting to understand better what I do and where I'm coming from. We'll see what the future holds. 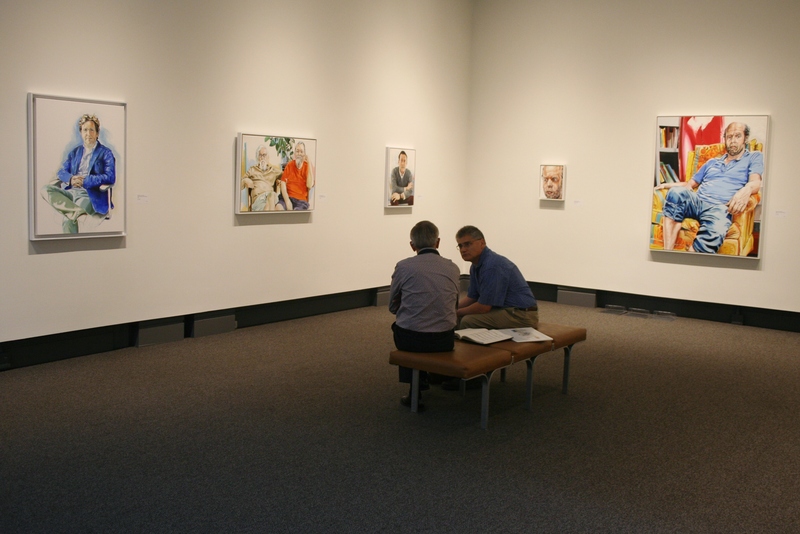 Carnegie Center for Art and History, New Albany, IN, July 24 - September 26, 2015. Swanson Contemporary Gallery, Louisville, KY, November 6 - December 12, 2015. Patio Gallery, Louisville, KY, January 3 - February 9, 2016.